Is your email really secure? Use 2 step verification to secure your Gmail account. Well, what is this 2-step verification? It is a very simple and efficient way to secure your email account with the help of your mobile phone. 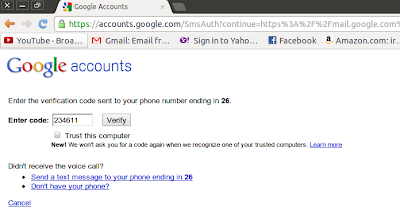 You register your mobile number with Google, and whenever you login to your Google account, a text message or a voice automated call will send a unique verification code to your mobile phone. You then enter this code when it is prompted to you during login. You will be prompted for this randomly generated code everytime you login to your account.This system ensures that even if someone knows your password, he will not be able to login to your account. This will also let you know immediately if someone tried to login to your account. Security is reassuring, but what about convinience? Some might find it irritating to receive a text message or a call everytime he wants to check his email. To overcome this hurdle, there is an option for remembering or “trusting” a device or computer that you frequently use to login. This will make sure your are 'remembered' until your cookies are cleared.